Ahead of the release of his new book, the author chats with Alexandra Alter. Are you feeling bewildered by the pace of technologically-dictated 21st century life? 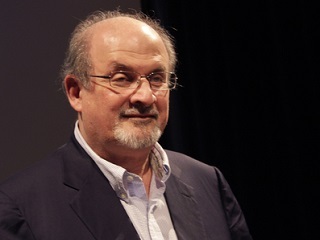 Author Salman Rushdie, in a recent Q&A with The New York Times’ Alexandra Alter, touched upon that strand and summed it up beautifully. A. It connected in my mind to this idea I had about living in a world where the rules are breaking down, where the world is changing so fast in all directions that a lot of people have a sense of bewilderment. You don’t actually know what the rules are anymore, and you have a sense that maybe there are other people much younger than you who do know what the rules are, and are thereby making billions by inventing, what, Snapchat? What the hell is that? That, apparently, is worth billions. Novels are worth, if you’re lucky, a six-figure sum. Q. Do you use Snapchat? A. No. I know that it exists. Kudos to Alter, with that follow-up question (and another towards the end involving One Direction), for engaging in another age-old idea: cheeky vs. serious. Read her full conversation here. Rushdie’s new novel arrives Tuesday.